Side Power Marine Thruster Systems, manufacturer the world’s most comprehensive line of Bow Thruster and Stern Thruster for leisure boats and smaller commercial boats, and we can therefore offer a suitable thruster for almost every boat under 160 feet. 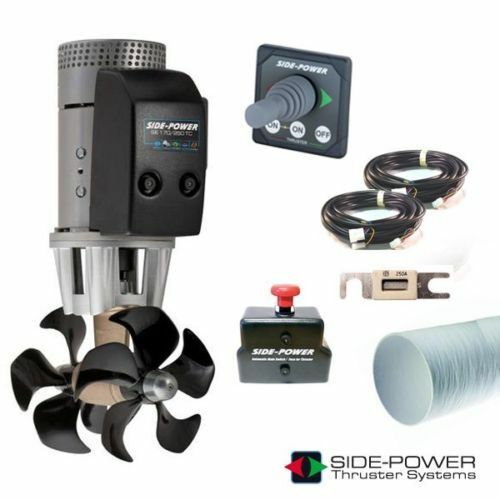 To enable the most safe and easy installation as well as the best possible performance for a variety of boats and usages, Side Power thruster are offered in several versions to satisfy all requirements. The first Side-Power thruster was developed in 1985 and today’s tunnel thruster are a result of almost 30 years of development. As the main Sleipner product, it has been continually developed and improved over the years. Today, Side-Power is widely recognized as the world leader within our segment. An overwhelming number of the world’s leading boat builders choose Side-Power for their fine vessels. Side-Power has always been at the forefront of thruster innovation and today’s SE series thruster has a series of patented safety solution. The SE series have been installed in tens of thousands of boats around the world for almost three decades. We dare to claim that it is very hard to find a more sturdy and proven construction than that of the SE series. Our tunnel thruster can be installed as bow and/or stern thruster and are delivered in both a standard and a PRO version. The PRO version are equipped with a DC speed control, which gives you full proportional control of the thruster. If you plan to install both bow and stern thruster, the system offers the unique Hold-function which pin the boat to the pier while docking. Side-Power thruster in a gas- and watertight version. This is the second generation with more upgrades and a larger range of models. The IP versions has all the benefits and proven reliability as the SE series. To provide reliable and safe thruster installations in more boats, we offer modified versions of our DC electric thruster in watertight housings for use in stern and other locations that may get wet or be exposed to gasoline fumes. These thrusters are fully ignition protected (ISO 8846) for use in boats with gasoline engines. not have to fit any other parts that can jeopardize the hermetical seal. Yachtaid Marine has developed a solution that regulates the effect under all conditions. With the new DC Speed Control you can drive your thruster at any speed you want and therefore get perfect control over the thrust. If you install both an effect regulating bow and a stern thruster, you also get the unique Hold-function which holds the boat alongside the dock. It has never been easier to dock a boat on your own. In 2011 the DC Speed Control system won the prestigious Innovation Award at the Miami Boat Show. This is the industry’s own award and is highly regarded by equipment manufacturers around the world.